Be a part of our soul winning team! Welcome to 2020 Vision Partnership! Your gift of just $20 a month can help us save billions of souls. How much would you give to change the world and reach a billion souls? For $20 a month, you can impact billions of people! How? 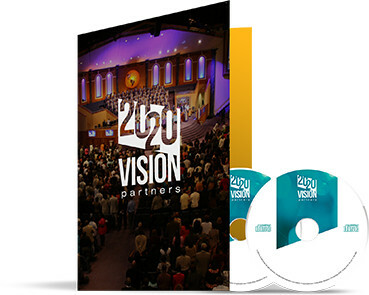 By becoming a 2020 Vision Partner with us. This is not a new partnership program. However, it is our new emphasis on partnership. God can bless the inside walls of the Church when we’re willing to go outside those walls. He needs people willing to “go ye” into all the world and share this glorious Gospel of grace! When you do, you no longer have to go door-to-door knocking to win souls—now you can get in the house! It’s so important that the Gospel of grace is preached worldwide. You may think, what can such a small donation do for somebody? Just like Jesus used the crumbs from a little boy’s lunch to feed the multitude, He can take the little that you have and change the world. It’s time for partners and friends to put our crumbs in the basket and change lives globally! In His hands, Jesus can multiply that precious seed and make it do what it needs to do! As a 2020 Vision Partner, you have the opportunity to get 2020 vision of God’s grace going into places removing burdens and destroying yokes, freeing people from shame and guilt. Get a vision of grace being preached on every continent! Get a vision of your $20 a month working every day. As you take the equivalent of the widow’s mite, and give it to God to impact billions with the Gospel of grace, you can expect grace explosions to take place in your life. Like the little boy who sowed his lunch, you too will experience supernatural abundance. Your choice to connect changes everything. Join the frontline with Pastors Creflo and Taffi Dollar to spread the Gospel of Grace to those in need. By signing up today, you will also receive exclusive access to the 2020 Partnership Portal.